Feel it – The second step he stressed was to move from mental imaging to muscle and mental memory. He stressed the importance of “rehearsing” your practice shots with the type of swing and intensity required to “execute your vision.” He demonstrated how most golfers take a half-hearted swing before their actual swing and challenged the audience with the question – “do you think this type of swing will deliver the “see it” vision in your mind?” The answer he was seeking was obvious – NO. 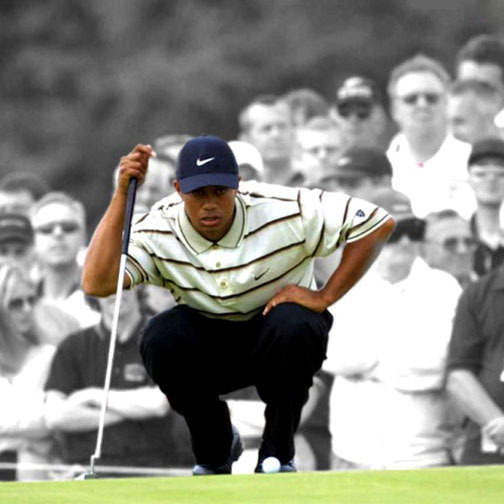 Just Do it – Finally, with the feeling imprinted in your mind and your body conditioned to the ideal swing he encouraged you to step up to the ball, don’t over think what you need to do, commit with confidence and then execute – or strike the ball to land in the middle of the fairway 300 yards from the tee ☺. See it: Spend quality time with your clients gaining clarity on three fundamental questions: Where are they today? What is their vision for a better future? What price are they willing to pay? Feel it: Create momentum by moving from thought into action. Rehearse and create the confidence in your client through “active rehearsal”; don’t allow “half-hearted” swings – only swinging for the green is allowed. Just Do It. Finally, take action. Create the plan to move from thought to action. That is the true definition of personal power – the ability to take action. It is not about knowing more, it is about doing more. And then the exciting part – JUST DO IT!